The World Boxing Organization (WBO) announced the officials for two WBO World title bouts to be held this Saturday, August 25th in Arizona. In the main event, WBO Lightweight (135 lbs) World Champion Raymundo Beltrán, from México, will face WBO ranked number two José Pedraza, from Puerto Rico. For this bout, which will headline the card presented by Top Rank from the Gila River Arena in Glendale, the referee will be Tony Weeks, from the United States. Arizona’s Rubin Taylor, as well as Lisa Giampa and Robert Hoyle, both from Nevada, were appointed judges for the bout. The WBO Supervisor will be WBO President Francisco “Paco” Valcárcel, Esq. For Beltrán (35-7-1, 21 KOs), it will be his first defense of the title he won by beating WBO Africa Lightweight titlist Paulus Moses via unanimous decision. On his part, Pedraza (24-1, 12 KOs) is looking to be crowned a two division World Champion with a victory over Beltrán. He previously held a title as a Junior Lightweight (130 lbs). In the co-main event of the evening, WBO Junior Featherweight World Champion Isaac Dogboe, from Ghana, will battle WBO ranked number six Hidenori Otake (31-2-3, 14 KOs), from Japan. For this bout, the referee will be Chris Flores, from the United States. Illinois’s Patrick Morley, Texas’s Javier Álvarez and Connecticut’s Glenn Feldman were appointed judges for the bout. The WBO Supervisor will be WBO Vice-President North America/Chairman of North American Boxing Organization Richard de Cuir. For Dogboe (19-0, 13 KOs), it will be his first defense of the title he won by defeating former WBO World Champion Jessie Magdaleno by 11-round knockout. Beltrán-Pedraza and Dogboe-Otake will air live on ESPN and ESPN Deportes at 10:30 p.m. ET, with undercard action streaming live beginning at 7:30 p.m. ET. on ESPN+ — the recently-launched multi-sport, direct-to-consumer subscription streaming service from The Walt Disney Company’s Direct-to-Consumer & International segment in conjunction with ESPN. 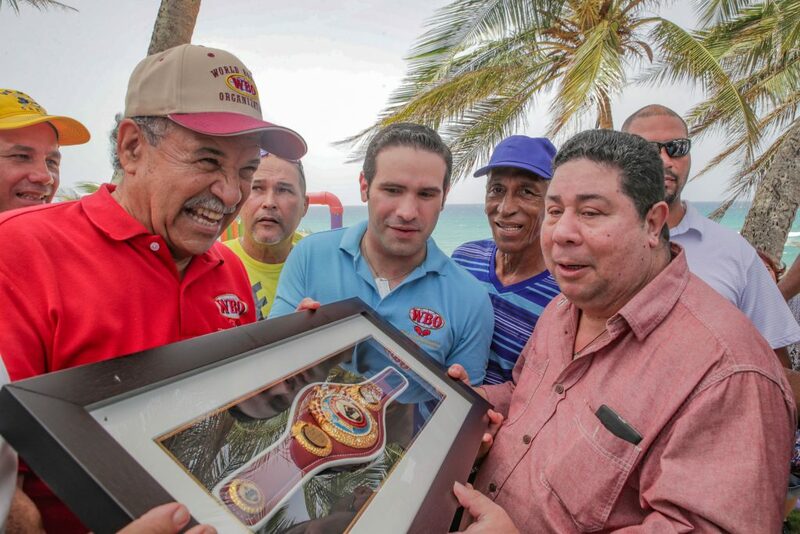 In a crowed activity held in Arecibo, the World Boxing Organization (WBO), with the collaboration of former world champion Samuel ‘El Torbellino’ Serrano, brought together several former Puerto Rican world champions along with currents boxers to recognize the trajectory of former three-division world champion Wilfredo ‘Bazooka’ Gómez. “Had the WBO existed in the Gómez era, he would have been our champion. But we still celebrate him because of his legacy in the ring and his great humility as a person. This belt that we preset to him today names him a WBO ‘Honorific Champion of Champions’, yet it is only a small sample of the affection and admiration that we have for him,” said WBO president Francisco ‘Paco’ Valcárcel. In addition to Valcárcel, Serrano and Gómez, former world champions Angel ‘Cholo’ Espada, Alfredo ‘El Salsero’ Escalera, Orlando Fernández, Ángel ‘La Avispa’ Chacón, Josué ‘Dickie’ Camacho, Alex ‘El Nene’ were present at the party Sánchez, John John Molina, Rafael del Valle, Iván Calderón, Daniel ‘La Cobra; Jimenez, Nelson Dieppa, Víctor ‘Luvi’ Calleja, three times world title contender Wilfredo Rivera, former NABO champion Daniel ‘Pipino’ Alicea, current boxers Víctor Bisbal, Jean Carlos ‘Lobo’ Torres, Wilfredo ‘Bimbito’ Méndez, Luis ‘Popeye’ Lebrón (WBO Latino Featherweight Champion) and amateur national youth champion Tatiana Ortíz. Trainers Dennis Pantoja, Yoel Gonzalez, Félix Pagán Pintor, Margaro Cruz, as well as referees José Hiram Rivera and Roberto Ramírez, Jr., promoter Peter Rivera, and Chairman of the WBO Rankings C-ommittee, Edgardo López Sasso together with WBO legal advisor and member of the WBO Regional Titles Committee Gustavo Olivieri and other sports personalities were sharing in the activity. Gómez won the gold medal in the first amateur world championships, held in Havana in 1974. He then jumped to the professional ranks and won world titles at 122, 126 and 130 pounds. He retired with a professional record of 44-3-1 with 42 wins by knockout, and is considered one of the best fighters of all time. 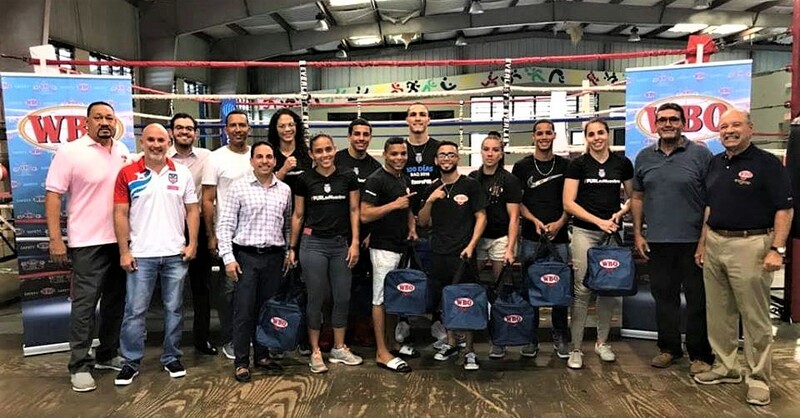 After bringing joy to the children of the center Sor Isolina Ferré in activity held last week in Ponce, the World Boxing Organization (WBO) donated today, sports equipment for members of the National Amateur Boxing Team of Puerto Rico, who will travel to Barranquilla, Colombia towards the Central American and Caribbean Games. The activity was held at the Olympic Village in Salinas. Rose Matos (51 kg), Ashleyaan Lozada (57 kg), Angelie Lopez (60 kg), Stephanie Piñeiro (64 kg), Nisa Rodríguez (75 kg), Óscar Collazo (49 kg), Yankiel Rivera (52 kg), Carlos Figueroa (60 kg), Omar Rosario (64 kg), Bryan Polaco (69 kg) and Luis Rodríguez (75 kg). The coach is Carlos Espada and Psychologist Carlos Villahermosa. The games will start on July 19. Representing WBO in the activity, was its president, Francisco ‘Paco’ Valcárcel,Esq and legal advisor and member of the WBO Committee of Regional Titles Gustavo Olivieri, Esq. Also present was the president of the Puerto Rico Amateur Boxing Federation José “Chiky” Laureano and the director of the Olympic Hostel Eugenio Guerra.